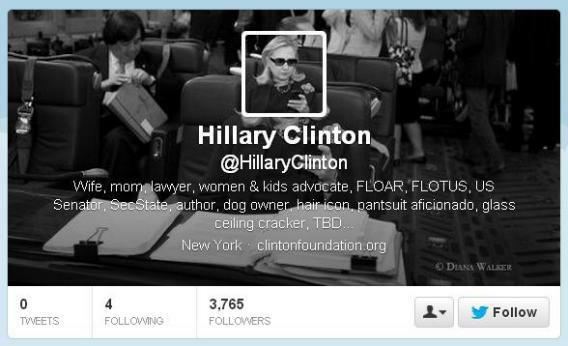 Hillary Clinton Twitter: @hillaryclinton bio describes her as "pantsuit aficionado," occupation "TBD." Reports have been floating for a few weeks now that Hillary Clinton, heretofore silent on Twitter, was planning to activate her account soon. But when the Twitter bio for @hillaryclinton went live on Monday, it seemed too good to be real (see above). Wife, mom, lawyer, SecState, sure. But “hair icon” and “pantsuit aficionado”? That seemed more like how a subtle Twitter parodist would describe Clinton than anything she would publicly say about herself. Most tantalizing of all was the last word in her bio, “TBD… “, which plays cleverly and coyly into the rumors of a 2016 presidential run. It was enough to make certain jaded journos doubt the account’s authenticity, even though the account’s first followers were the verified handles of Bill and Chelsea Clinton, which would have been very hard to fake. Indeed, as of about 12:45 p.m. E.T., @hillaryclinton had been verified by Twitter and issued her first tweet (which also happened to be perfect, with a shoutout to the co-creators of the “Texts from Hillary” meme). Her follower count rocketed past 35,000 in the space of an hour or two as fans signed on to see what she’d have in store next. Self-referential humor is a big part of Twitter, and Clinton’s first steps on the social-media platform suggests she has already grasped that part of its ethos. But those expecting a steady flow of wit and unfiltered insight from the account might be in for disappointment. The best Twitter accounts are not just clever but often casual and spontaneous—whereas Clinton’s bio and first tweet smack of perfect planning and sound advice from social-media experts, much like Obama’s forays onto Reddit. BuzzFeed political editor McKay Coppins, a minor Twitter celebrity himself, observed on Monday, “This @HillaryClinton twitter bio is awesome, but doesn’t quite match her public persona.” Actually, I think it does. It’s carefully wrought, tailored to a specific audience, and reflects ambition, shrewd planning, and careful execution. If there’s anything wrong with Clinton’s Twitter debut, it’s that she’s trying a little too hard to look like she’s not trying too hard. That quality will probably make her less of a Twitter sensation in the long run than, say, @DonaldTrump. But it makes for a far better politician.